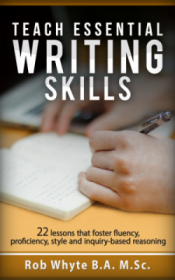 Teach EFL students four essential skills that will help them write with greater clarity, accuracy, logic and style. Transform the quality of EFL student writing by focusing on four essential skills: Fluency, Proficiency, Style and Inquiry-based reasoning. Designed for intermediate+ EFL students, this unique teacher resource focuses on developing the skills non-native speakers need to write faster and more accurately, with style and logic. With 22 lessons and 94 pages, there is enough teaching material to cover most classes for an entire 15 week semester.